It has been an up-and-down couple of years for department store investors, so the recent rally was welcome news. The excitement will be short-lived, though. Department store stocks jumped after U.S. election results came in on Nov. 8. 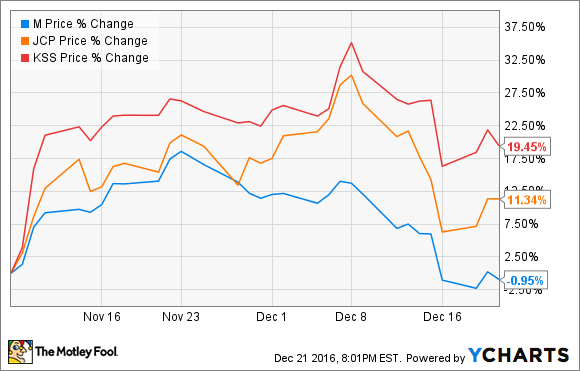 Shares of companies like Macy's (NYSE:M), J.C. Penney (NYSE:JCP), and Kohl's (NYSE:KSS) saw advances of 20% or more in the weeks following President-elect Donald Trump's victory, but prices have been pulling back once again in the last couple of weeks. The woes for the retail juggernauts of yesteryear continue, so the negative retracement isn't a surprise. Still not out of the woods, the sector could have more pain to endure yet. 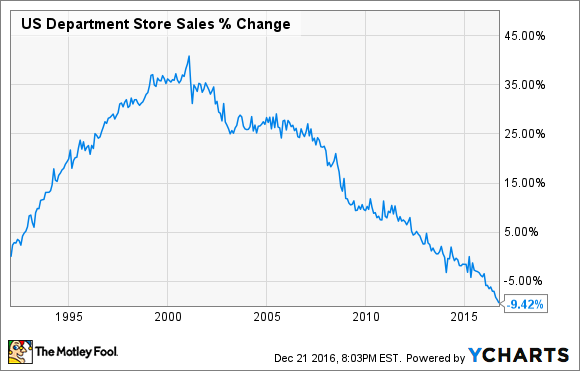 The problems department stores have been experiencing start with declining sales. In the U.S. Census Bureau's retail report for November, the average department store is showing a 5.2% year-over-year decline in sales. The trouble isn't new, though. The trend has been in place for some time now. After peaking in the early 2000s, consumer interest in the beleaguered kings of the mall has been in relentless decline. US Department Store Sales data by YCharts. One of the main reasons for the ugly numbers is that foot traffic is thinning out. This hasn't been an isolated occurrence. During the third quarter, Macy's reported a comparable-sales decrease of 2.7% from the same period last year and a 3.5% decline on the year. Kohl's wasn't much better, with a quarterly drop of 1.7% and a 2.4% decline year to date. J.C. Penney, still recovering from a botched makeover from a few years back, has been the exception to the rule and expects a slight 1% to 2% increase this year. Ever since the concept of internet-based purchasing took off, the average traditional store has been getting its lunch eaten. Americans love to go shopping, but we also appreciate convenience. As a result, digital-based sales have been growing by double digits, leaving brick-and-mortar locations the scraps. It isn't as if trips to the store have ceased to exist. However, with the advent of the internet, the number of physical locations needed to service the population has been reduced. Many retailers have been closing down underperforming locations to maximize usage of those remaining and use new digital stores to fill in the gaps. For example, Macy's announced in August the closing of another 100 full-line locations out of its current 728 stores. Already, 90 locations have been closed since 2010. While the company expects the closures to lead to sales reductions of $1 billion, plus another $249 million in charges to close, it believes that expense savings will soon offset those losses and free up cash for more-profitable locations and digital sales efforts. Kohl's and Penney have also been closing locations, but at a slower rate. Penney closed seven locations in small markets this year, and Kohl's closed 18 in attempts to curb costs and increase profitability even against the backdrop of falling overall sales. In light of the industry's deteriorating business, the recent rally in share prices following the election was unwarranted. Nothing about the situation at department stores had materially changed, so it was inevitable that the run-up would reverse. The next big test will be after the New Year, when retailers start to release results from the holiday shopping season. In today's digital world, it seems that there are still too many physical stores in existence. There is still a place for brick-and-mortar storefronts, but companies haven't yet found the perfect balance between those and digital stores. Chart by author. Data source: U.S. Census Bureau's Retail Trade Report. As long as digital sales continue to grow at an aggressive rate, it will be hard to get excited about any rally in department stores. For me, it's too early still in this shakeout to put any money on the table.